Aikatsu Stars! – 095 | Mezashite! This stands in important contrast to something, but what is it? How do you beat perfection? Dab on it. This entry was posted in Aikatsu Stars! by Akatsukin. Bookmark the permalink. >This stands in important contrast to something, but what is it? He means that this scene has remarkably improved in terms of animation; in the previous episode, the only faces we could see in clear detail were Yuri and Miki, while the other admins were drawn poorly or hidden away in the background. This time around, all of them are positioned clearly, while several familiar faces like Alice and Tamaki are shown as well. Edit: I forgot that Miki had already graduated; the other admins are Bird Theater’s Sakamoto Arisa and the Moon Beauty admins, who for some reason never had any speaking lines, let alone interacted with Mahiru and Koharu. Good catch. You remembered that shot all week? I can see why Akatsukin remembers, since he watches each episode multiple times, but for anyone else it’s pretty impressive. I uh, meant that Elza’s all alone, and that unlike last time she doesn’t even have Rei there… but sure, that too. The amount of happy faces in the preview makes me think everything will be resolved by next week, but there are still some unanswered question… and another four episodes. That’s too much for a simple wrap-up, isn’t it? 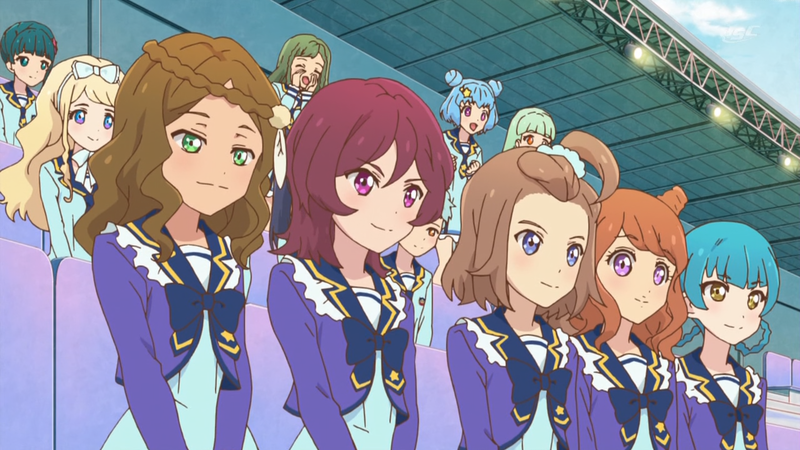 Knowing Aikatsu they’ll start a final three-episode arc after the current situation is resolved. I remember back when the first Aikatsu was near its end (~170 episodes in) we didn’t know how they were going to conclude the series in time, but they managed to wrap it all up in the last two or three episodes. Stars looks to be a similar story.